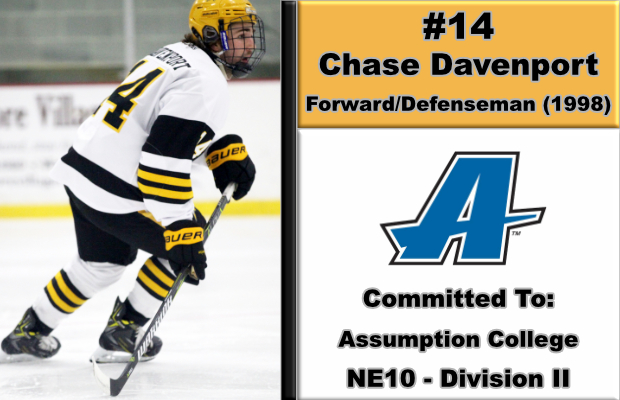 BEDFORD, MA -- The East Coast Wizards are pleased to announce that Chase Davenport has committed to Assumption College for the Fall of 2018. The '98 spent the past two seasons with the Wizards, tallying 16 total points in 93 career games in the EHL. "Chase was a huge asset to our team over the past two seasons," said Wizards head coach and general manager Freddy Meyer. "He's the type of player that would do whatever was asked of him, whether that meant playing offense or defense. Chase was a leader for our group, and was by no doubt a huge factor in the steps that we've taken as a program. Kory and I can't wait to watch Chase continue to develop at Assumption." As Meyer mentioned, Davenport bounced back and forth between offense and defense, but never let it make an impact on his overall play on the ice. The native of Princeton, MA was as reliable as any member of the Wizards, and he'll now join a program that has brought in nine different players from the EHL since the league was formed back in 2013. Davenport took some time to reflect and give his thanks to all those who helped him reach this point in his journey. "I'm extremely glad that I decided to play for the Wizards, as I've learned so much and had an absolute blast in the process," said Davenport. "It's a wonderful place to play and it's been a huge part of my development. I'd like to thank Coach Freddy, Coach Kory, and Adrien for their support and guidance over the past two years. I'm looking forward to starting the next chapter of my career at Assumption College."